Boyd Buchanan School FFA received a $3,000 grant from Farm Credit Mid-America, a financial services provider serving approximately 100,000 farmers and rural residents throughout Indiana, Ohio, Kentucky and Tennessee. “We are beyond grateful to receive this grant from Farm Credit,” said Melissa Owens who oversees the AgriScience program at Boyd Buchanan. “This farm-to-campus program brings great diversity to our academics as well as to our extracurricular activities. The students truly enjoy this highly engaging agricultural experience." Boyd Buchanan School began their AgriScience program in 2014. The faculty and student-managed Blue Thumb Gardens opened on the school’s 60-acre campus in 2014, which spearheaded the AgriScience program. Boyd Buchanan became an official FFA chapter in Spring 2018. Boyd Buchanan is the first-ever independent school FFA chapter in the state of Tennessee, according to FFA officials. “Farm Credit is passionate about serving our customers, rural communities and agriculture,” said Alyse Anderson with Farm Credit Mid-America in Chattanooga. “Advancing initiatives that support the next generation of agriculture is part of who we are as a company.” Anderson says supporting the Boyd Buchanan School FFA is one of the ways we demonstrate our commitment of securing the future of rural communities and agriculture. 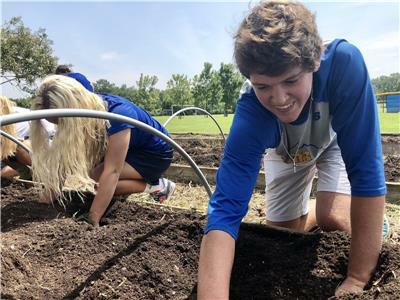 In recent years, Boyd Buchanan has added kitchen herb beds, a bee colony, as well as a chicken tractor. Fruits and vegetables from the cafeteria are composted and added to raised beds each year. Additionally, coffee grounds are fed to black soldier fly larvae that are fed to chickens as a sustainable protein source. Spring chicks are also hatched in the school’s incubator. The school will also be adding the Department of Education’s Veterinary and Animal Science Program of Study to their course offerings.